“The Allies” is Winston Groom’s twentieth book, his twelfth book of nonfiction. Not surprisingly, he has become a smooth storyteller, usually writing about America’s wars—Civil, 1812, or the Western Front in WWI, reading and synthesizing huge quantities of material and presenting it in narrative form for the common reader. 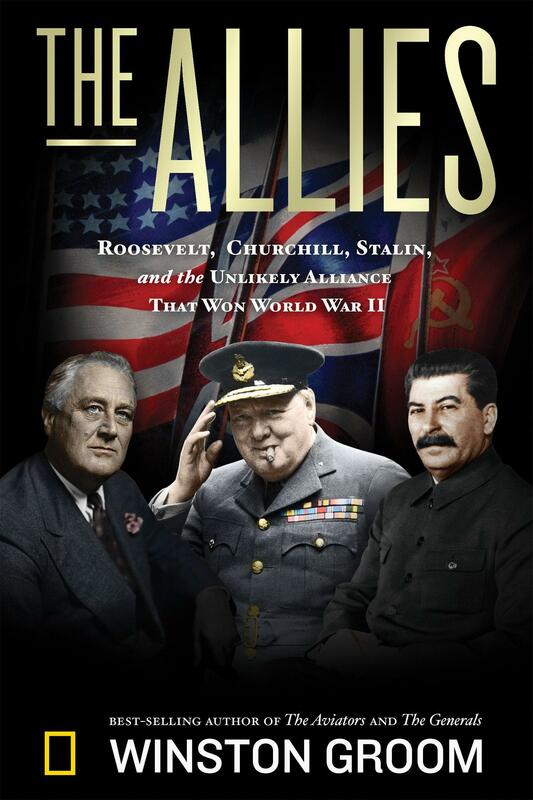 Now we have “The Allies,” the story of the relationship among the three rather different men who directed that enormous, global war effort. First, as one might expect, Groom delivers concise, brisk, biographical sketches of the three individuals, raised in three widely separate and culturally varied places. Roosevelt, an American patrician, was descended from the earliest Dutch settlers of the Hudson Valley, and his cousin Theodore had been president of the United States. The family was rich, he was handsome and charming. Roosevelt graduated from Groton Academy and Harvard. Except for the attack of polio at 39 in 1921 which left his legs paralyzed, Roosevelt’s was a charmed life. Stalin, on the other hand, was born in the Caucasus into a world of poverty and violence. His father was a drunken cobbler who beat him. His mother was an unfaithful wife who, surprisingly, got young Josif enrolled in a Russian Orthodox Seminary at the age of 14, where he received a decent education but became a priest, so to speak, of the Communist movement, not of Russian orthodoxy. Stalin is largely a self-invented man. Born in 1878, he changed his name from Josif Vissarionovich Dzhugashvili to Stalin, “man of steel,” and then rewrote his own biography, disavowed his mother and some of his own children and killed off a great many of the people who had known him, so less is known about Stalin than any other major world figure. Exiled to Siberia several times, he escaped and rose in the Party to a position of absolute power, murdering millions of his countrymen along the way. Stalin’s cruelty is world famous but still takes your breath away. Before the war he had liquidated 500 generals he thought might be competitors. (This did not help the war effort.) Generals who lost battles were shot. The families of Soviet soldiers captured by the Germans were sent to labor camps in the Gulag. After the war he shot or imprisoned Soviet soldiers liberated from German POW camps. In the drive to turn all farms into collective farms, Stalin met resistance from the kulak class, those small farmers who had risen enough above serfdom to have “more than one cow, a field of goats or a hired hand.” Stalin had as many as 7 million kulaks liquidated between 1929 and 1932 and starved perhaps another 10 million peasants to death to bring them into line. Churchill, a descendant of the Duke of Marlborough, was born at Blenheim Palace, outside Oxford. He was sent to Sandhurst, the British West Point, and would be a highly decorated army officer in India and South Africa. His parents were wealthy and such busy socialites they paid young Winston no attention at all, leaving it all to the nanny. One senses that Groom feels bad for Churchill, who adored his parents but was sent away at the age of seven and then ignored. He wrote especially to his mother begging for a visit: “Please do come. I have been disappointed so many times.” But she rarely did. Churchill’s career certainly had its ups and downs. Blamed for the failure at Gallipoli, Churchill lost public office and went to the front in WWI. Having brought Great Britain through the Second World War successfully, he was voted out of office again in 1945. Often in financial trouble from lavish living on a small army salary, Churchill discovered he could write, made a fortune with his books, and won the Nobel Prize for literature. Groom summarizes nicely the war years, the campaigns in Europe, North Africa and the Pacific, and the coordination of the three leaders, but there is a built-in problem. Churchill and Roosevelt came to know and respect one another fairly well, Churchill having met with FDR repeatedly to urge America to support, then to join, the war effort, after which the two communicated constantly by letter and phone. Nobody knew Stalin, and the three met in person only twice, in Tehran and in Yalta, to `strategize over the war, and then to plan the post-war peace. It would take the death of Stalin and 50 years of Soviet occupation to bring Eastern Europe to its present state of freedom.